Please ensure the following form is completed in full prior to your dog's first visit. Blank forms are available for pickup. You may also fill out the electronic form below. Please make sure you fill out your email address so we can contact you when your form is approved. These forms must be filled out in full and approved by the daycare prior to your dog's first booking. If you do not hear back from us after filling out the form please contact us as we may not have received it. Fields marked with * are required. The following are the names of individuals that have your permission to pick up your dog(s) from K9to5 Dog Daycare & Grooming. You understand that once dogs are released into the care of authorised persons or individuals that K9to5 Dog Daycare & Grooming is no longer responsible for the well being of your pet. proof of all vaccinations including Kennel Cough and Revolution. We strongly recommend all dogs be on a flea/tick/lice prevention program . *Please note if your dog has been ill with a communicable or potentially communicable disease within the past 30 days a health clearance signed by a licensed veterinarian must be received before your dog can attend daycare. Please do not bring ill (vomiting, diarrhea, eye/ear infections etc) or injured (sore, limping etc) dogs to daycare. Growled at someone? Bitten or snapped at a person? Reacted negatively when food or toys are taken? Been in a fight with another dog? We accept dogs of all ages. Puppies must be over 12 weeks and on a vaccination program. Puppies or shelter dogs must have been in the home for at least two weeks prior to attending daycare. All dogs require up to date vaccinations. Proof of vaccination or titer testing is required. Dogs that are currently ill or injured are not permitted at daycare. Owners certify by signing this application that their dogs are in good health. All dogs must be non-aggressive and not food or toy possessive. Owners certify by signing this application that their dog has no history of harming or threatening another animal or person. Pick-ups must be competed by 6:00PM. Late fees for late pick-ups apply at a rate of $15.00 for every 15 minutes past 6:00PM no exceptions. Daycare passes have no cash value, are non-refundable, and expire 90 days from date of purchase. No exceptions. 1. I hereby represent that I am the legal owner of the dog(s) described above to use the services provided by K9to5 Dog Daycare & Grooming. 2. I hereby waive and release K9to5 Dog Daycare & Grooming, it’s employees, directors, owners and agents from any and all liability which my dog(s) may suffer, including specifically, but not without limitation, any injury or damage whatsoever arising from the dog(s) attendance and participation of services provided by K9to5 Dog Daycare & Grooming. 3. I hereby agree to indemnify and hold harmless K9to5 Dog Daycare & Grooming; it’s employees, directors, owners and agents from any and all claims by any member of my family or any other person accompanying me to a function of K9to5 Dog Daycare & Grooming, or while attending the premises thereof, as a result of any action by any dog. 4. I hereby represent that my dog(s) is of good health and has not been ill with any known contagious diseases within the past 30 days. 5. I recognize that the health of the dog(s) is the owner’s responsibility. I hereby represent that all required vaccinations (rabies, bordetella, distemper and parvovirus) are up to date. I will also continue to ensure that the required vaccinations will be kept up to date for as long as my dog(s) attends Dog’s Day Pet Care. In addition, I hereby represent that my dogs have flea/tick preventative treatments applied regularly. 6. I further understand and agree that in admitting my dog(s), K9to5 Dog Daycare & Grooming has relied on my representation that my dog(s) is in good health and has not harmed, shown aggression or threatening behavior towards any other person or any other dog. 7. I further understand and agree that K9to5 Dog Daycare & Grooming and their caregivers will not be held liable for any problems that might develop with my dog(s) including, but not limited to sickness, disease, injury, running away and death, provided that reasonable care and precautions are followed. 8. I understand and agree that any problem that develops with my dog(s) will be treated as deemed best by the care-givers of K9to5 Dog Daycare & Grooming at their sole discretion and that I assume full financial responsibility for any and all expenses incurred. 9. K9to5 Dog Daycare & Grooming fees and packages are non-refundable and non-transferable. 10. I agree that my dog(s) may be videotaped, photographed and or recorded. 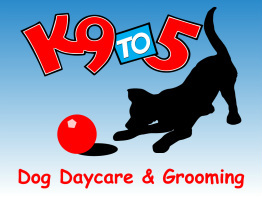 K9to5 Dog Daycare & Grooming shall be the exclusive owner to the results and all proceeds of such media. 11. K9to5 Dog Daycare & Grooming reserves the right to permanently remove a dog from care at any time to ensure the safety of other dogs as well as staff. 12. I understand that the rules above apply to any dog(s) of mine attending daycare and grooming.